As several others have commented recently, my MiFi 4082 will not connect to the Internet. 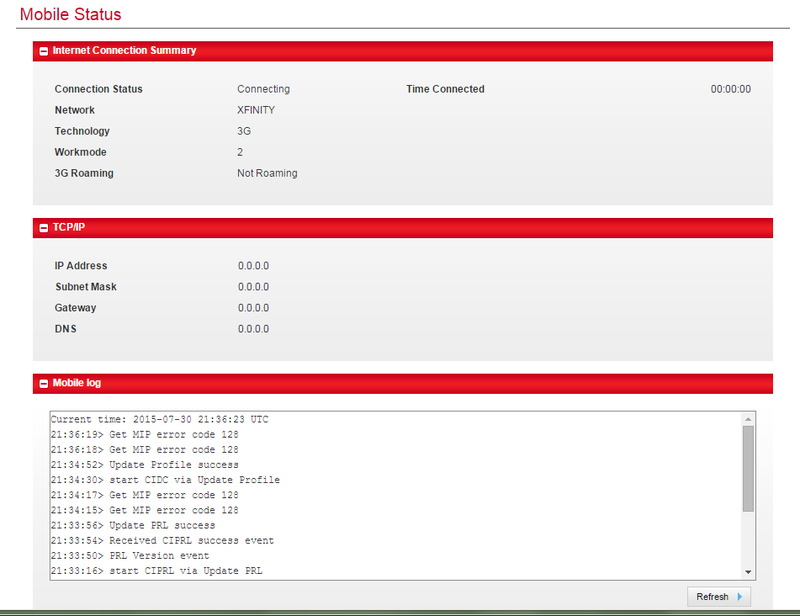 I can connect to the device via WiFi, it has a good 3G signal (I don't have 4G reception), and the log shows "MIP error code 128". I have done many PRL and Profile updates, (the log shows success each time), I've power cycled the device and pulled the battery, but it still won't connect. I have zero data usage this month. What else needs to be done to get this working again? Any support agents awake out there? There are a lot of forum users posting the same problem, and nobody has responded. The attached screenshot shows the errors I'm getting even after updating PRL and Profile. Who can get this device to start connecting? A telephone support agent said that he would refer the problem to the "device escalation team" because my account showed the device as "activated" instead of "active". That is apparently a common problem with Sprint, and there is nothing users can do to fix it. Here's hoping the device will be working tomorrow.